The management and distribution of water in Spain has always been guaranteed by the government, but in recent years, the private companies are entering the business. 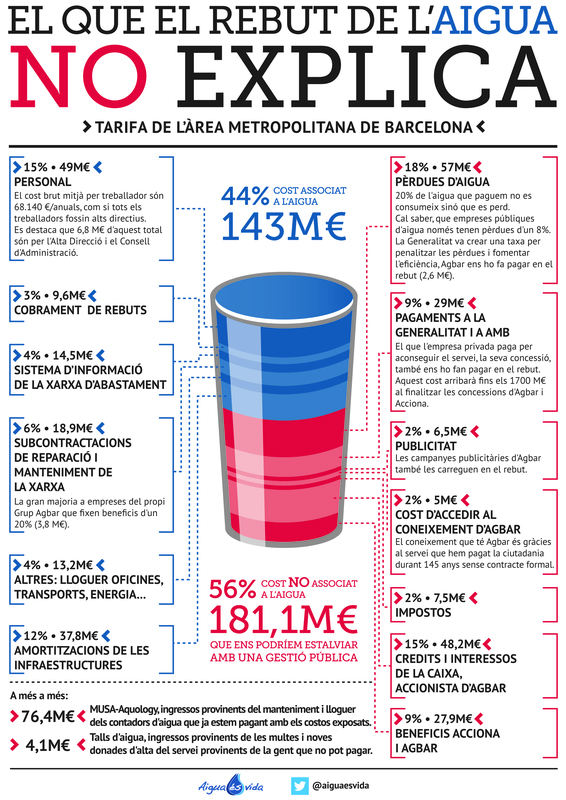 Ninety percent of private water management in Spain is handled by just two companies, mamely Aguas de Barcelona (Agbar) and Aqualia dependent Fomento de Construcciones y Contratas (FCC). The private water companies pay large amounts of money to municipalities beset by an economic crisis to gain access to public water supplies. Many municipalities across Spain do their privatization bids without consulting with their residents who are the first to pay a higher rate for water. Following the sale of 52% of the municipal Alcazar water company, the contract went to Aqualia, a subsidiary of FCC. The private water company Aqualia first began to deviate from the contract in 2007 and requested more money from local government to balance its accounts. Aqualia had agreed to invest 19 million euros in the water supply system during the contract period, but it invested only 2 million euros. Meanwhile, private water companies are moving their offices out of commercial venues and into the town hall building in order to save on rent and maintenance costs.